...said their son, billed as "Little David" was not getting a proper education and that almost daily sermons threatened "permanent disability" to his voice. They estimated his sermons earned him $1000 per week. The parents asked Juvenile Court to return custody of David to them. 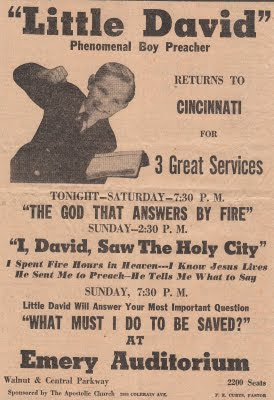 They had unwittingly lost control when another evangelist promised to "put Little David in the big time." Several years later Little David was involved in a water ski accident which put him in a coma briefly. I do not know if he saw Jesus the second time, but he did thank the fireman who saved his life.